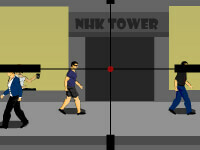 Description: Sneak your way through new levels of Ultimate Assassin! Move around the warehouse to assassinate your target, and then get to the exit. Complete your mission as quickly as possible and without being seen. Stepping into a guard's field of vision will set off the alarms, and the guards won't hesitate to kill you. Your ability to run and turn invisible will help you evade the guards.. Ultimate Assassin 3 Level Pack is a Sniper Games. Instructions: There is a in-game tutorial..